Almost one year after the first Ratchet & Clank was released on the PlayStation 2, comes the amazing sequel that not only goes beyond the first game but is truly a worthy successor. 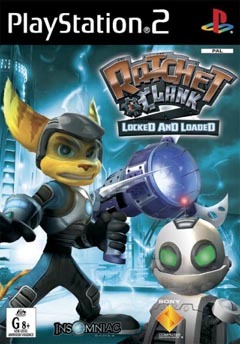 The game revolves around two characters called Ratchet and Clank who became fast friends in the previous game and threw them both into the roles of unsuspecting heroes. Although both heroes have returned to their homes and are now enjoying the high life, Ratchet discovers that a group of nefarious aliens have stolen an experimental creature from MegaCorp that not only threatens his home world but also the known universe. Called to arms by the president of MegaCorp, Mr. Fizzwidget, Ratchet must now return this kidnapped creature to MegaCorp and also rescue his friend Clank who has vanished without a trace. 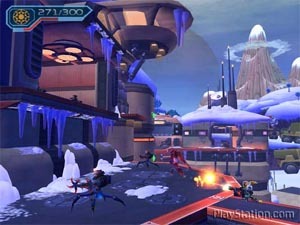 Unlike certain arcade game sequels (that won't be mentioned in this review), Ratchet & Clank: Locked and Loaded is a huge improvement over the original saga that features the same witty storyline as the first but has improved graphics and a variety of new gameplay options that keeps this title both fresh and entertaining. The developers have also added a new aspect into the gameplay of the game by giving players the option of upgrading their weaponry. As you continue to fight your way through Ratchet & Clank: Locked & Loaded, your weapons gain experience as you dispatch enemies until they become deadly weapons of destruction. This new RPG aspect of the title also gets passed onto Ratchet, who also gains experience points for eliminating enemies and by going up levels, Ratchet is awarded addition life points to his health metre. As with all good arcade games, the title is littered with bonus weapons and equipment that can be found throughout the gaming world that include items such as platinum bolts that give you addition bolt points and power wrenches that increase your ability to perform more damage on your enemies. The bolts in Ratchet & Clank are used to purchase weapons, upgrades and new items from shopkeepers that truly spice up the gameplay of this title. The most noticeable feature of this new instalment of Ratchet & Clank are the mini-games that help break up the stock standard arcade levels of the game. Some of these mini-games include simplistic Star Wars type space battles that have you flying through meteor fields and dispatching enemy space crafts, competing in hover craft races and even desert mining. 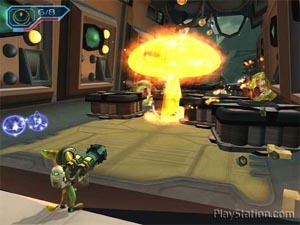 Ratchet & Clank is a brilliant arcade game that features the stock standard arcade levels where you must jump, use your items, solve mini-quests, defeat enemies and defeat bosses that goes hand-in-hand with the storyline but is nicely spruced up with the mini-games that keep a fresh spin on the title. The control system of the game uses a combination of the right analog stick to control your characters with the left analog stick to control the camera angle and the d-pad and shoulder buttons used to control your weapons and equipment. The combat of the title is a little on the easy side and once you have figured out the weaknesses of the enemies that you encounter, you should have no difficulties whatsoever in defeating the foes in the game. The game itself will take the average to professional gamer around 20 hours to compete but that is not taking into consideration the secrets that are sometimes almost impossible to find, therefore you are guaranteed to play this title a few times more. Although you can save the game anywhere in the game, it always takes you back to the first check point when you reload the game, fortunately the game is littered with dozens of checkpoints that help you finish the levels easily. Graphically, Ratchet & Clank: Locked and Loaded is a huge visual improvement over its predecessor and once again pushes the PlayStation 2 to its "known" limits. 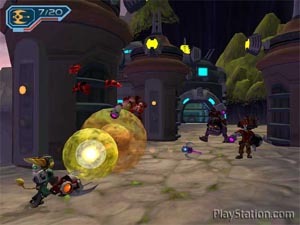 Although the characters themselves appear the same as the previous game, the most noticeable achievement of this title are the huge 3D worlds that quite simply look spectacular, especially the 3D mining planet that not only rotates on its own orbit but also has hundreds of objects moving on screen at once without any slowdown. Both the two game heroes also have been given a new polish and look sharper and more detailed than their previous selves. Although the game doesn't have any pre-rendered cutscenes, the game is nicely moved along with in-game cutscenes that suit this title perfectly, especially considering how entertaining these cutscenes are. The musical score of Ratchet & Clank: Locked & Loaded features a similar range of tunes from the previous game that although is nothing too memorable, helps immerse the gamer nicely into this animated and futuristic world. The voice acting of the title, although professionally done is extremely cheesy and entertaining and help make the gags quite hilarious when they are talking. The game also features a plethora of Hollywood type science fiction sounds from space ships taking off, the sounds of huge weapons being fired and of course that familiar sound of picking bolts up from the enemies that you have defeated. In conclusion, Ratchet & Clank: Locked and Loaded is an extremely addictive and fun title that would appeal to gamers of all ages. The gaming engine of the title is extremely sturdy that not only contains exceptional graphics but also a brilliant control system that even the most novice of gamers will be able to master after a few minutes of playing this title. I would recommend this game to all gamers, especially those who loved the first instalment of this series and true lovers of arcade fun. Check it out!